Time to saddle up for some fun down at the Pony Farm. There’s so much to do here! This farm has a two-story barn to house your ponies with spacious stalls and attached feeders for afternoon munching. Climb the ladder inside the barn for easy access to the hayloft. Here, you can store feed, straw, and supplies for the ponies and might even catch a barn cat napping. Let the ponies out to play in the large fenced-in paddock. Don’t forget to groom the ponies to make their coat shine. Clean-up in the barn is simple with the included pitchfork, broom, and wheelbarrow. 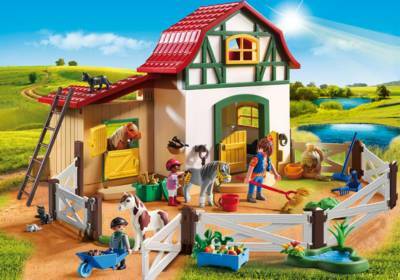 Set includes three figures, three ponies, two-level barn, adjustable fence, drinking pond, two cats, and lots of other accessories.